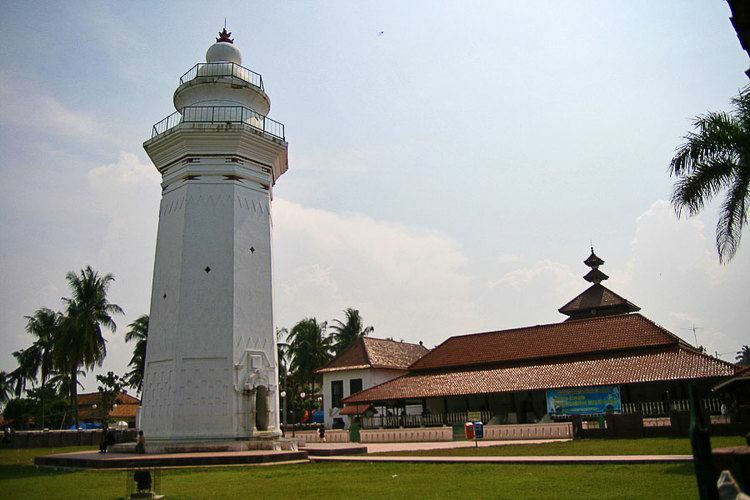 Banten is the westernmost province on the island of Java, in Indonesia. The provincial capital city is Serang. The population of Banten was officially estimated at 11,834,087 at the start of 2014, up from over 10.6 million during the 2010 census. Formerly part of the province of West Java, Banten became a separate province in 2000. The province is a transit corridor to the neighbouring Indonesian island of Sumatra. Historically, it has had a culture distinct from the rest of Java and that of the broader Indonesian archipelago. In recent years, the northern half, particularly those areas near Jakarta and the Java Sea coast, have experienced rapid rises in population and urbanization, while the southern half, particularly that facing the Indian Ocean, maintains more of its traditional character. In the 5th century, Banten was part of the Kingdom of Tarumanagara. The Lebak relic inscriptions, found in lowland villages on the edge of Ci Danghiyang, Munjul, Pandeglang, Banten, were discovered in 1947 and contains 2 lines of poetry with Pallawa script and Sanskrit language. The inscriptions speak of the courage of king Purnawarman. After the collapse of the Tarumanagara kingdom, due to an attack by Srivijaya, power in the western Java fell to the Kingdom of Sunda. The Chinese source, Chu-fan-chi, written circa 1225, Chou Ju-kua mentioned that in the early 13th Century, Srivijaya still ruled Sumatra, the Malay peninsula, and western Java (Sunda). The source identifies the port of Sunda as strategic and thriving, pepper from Sunda being among the best in quality. The people worked in agriculture and their houses were built on wooden poles (rumah panggung). However, robbers and thieves plagued the country. It was highly possible that the port of Sunda mentioned by Chou Ju-kua was probably refer to the port of Banten. According to the Portuguese explorer, Tome Pires, in the early 16th century the port of Bantam (Banten) was an important port within the Kingdom of Sunda along with the ports of Pontang, Cheguide (Cigede), Tangaram (Tangerang), Calapa (Sunda Kelapa) and Chimanuk (estuarine of Cimanuk river). In 1527, just as the Portuguese fleet was arriving off the coast, newly converted Javanese Muslims under Sunan Gunungjati captured the port of Banten and the surrounding area from the Sundanese leaders and established the Sultanate of Banten. The center of this sultanate, according to J. de Barros, was Banten which was a major port in Southeast Asia rivaling Malacca and Makassar. The city of Banten was located in middle of the bay which is around three miles across. The city was 850 fathoms in length while the seaside town was 400 fathoms in length. Through the middle of town there was a clear river which ships and gale junks could sail into. There is a small tributary of the river extending to the edges of the town. Today, the river is not so large and only small boats can enter. There was a fortress very near to the town whose walls were made of brick and was seven palms wide. There were wooden defense buildings consisting of two levels and armed with good weapons. The middle of the town square was used for military activities and folk art, and as a market in the morning. The king's palace was located on the southern side of the square. Beside the building was an elevated and flat-roofed, called Srimanganti, which was used by the king when meeting the people. To the west of the square was a great mosque. In the early 17th century, Banten was an important commercial center on international trade routes in Asia. At the time, the administration and governance of port were very supportive of economic growth. Its territory included the area which is now the province of Lampung in southern Sumatra. When the Dutch arrived in Indonesia the Portuguese had long been in Banten. The English established a representative site in Banten, a "factory", and were followed by the Dutch. In addition, the French and Danes also came to trade in Banten. In the ensuring competition between the European traders, the Dutch emerged as the winners. The Portuguese fled Banten in (1601) after their fleet was destroyed by the Dutch fleet off the coast of Banten. While the coastal areas of Banten came under Dutch influence, the sultanate kept control over the inland region until 1813. In that year, the sultanate was abolished and transformed into a residency of the Dutch East Indies. After Indonesia became independent, Banten was absorbed into the province of West Java. However, separatist sentiment ultimately led to the creation of the province of Banten in 2000. Banten lies between 5°7'50" and 7°1'11" south latitude and 105°1'11" and 106°7'12" east longitude. The province has an area of 9,662.92 km². Banten is located near the Sunda Strait's strategic sea lanes that link Australia and New Zealand with Southeast Asia, for example Thailand, Malaysia, and Singapore. In addition, Banten is the link between Java and Sumatra. When linked to the geographical position, and then the government of Banten, especially highways Tangerang (Tangerang City, Tangerang and South Tangerang City) is a buffer area for Jakarta. Economically Banten region has many industries. Banten Province also had some sea port developed in anticipation to capture the excess capacity of the seaport in Jakarta, and is intended to be an alternative to the port of Singapore. Located on the western tip of Java makes Banten as the gateway to Java and Sumatra and the adjacent areas of Jakarta which is the capital of the State. Geostrategic position is certainly cause Banten as the main liaison trade lanes Sumatra - Java even as part of a circulation of Asian and international trade as well as the location of agglomeration economies and potential settlements. Limit northern region bordering the Java Sea, west of the Sunda Strait, as well as in the southern part of the Indian Ocean, so the area has a potential marine resources. The topography of Banten province at an altitude ranging from 0–1000 m asl. In general topography Banten Province is low land which ranges between 0–200 m above sea level, located in the city of Cilegon, Tangerang City, Pandeglang, and most of the Serang District. The Central Lebak and Pandeglang fraction has a height ranging from 201–2000 m asl and East Lebak area has an altitude 501–2000 m asl located at the summit of Mount Sanggabuana and Mount Halimun. The topography of a region associated with the surface expression shape or morphology region. Morphology Banten region is generally divided into three groups: the morphology of the plains, hills sloping to moderate (low-medium wavy) and steep hills. Lowland Morphology are generally found in the northern and southern portion. Plains region is a region which has a height of less than 50 meters asl (above sea level) to the coastal areas which have a height of 0–1 m above sea level. Low Hills Morphology - Medium largely occupied the central part of the study area. Hilly region located in areas that have a minimum height of 50 m above sea level. In the north of the city of Cilegon contained the peak of Mount Gede area that has the level of a maximum of 553 m above sea level, while there are hills in Serang District and the southern region of the District Mancak Waringin Kurung and Pandeglang Regency hilly areas are in the south. In Lebak there are hills in the east bordering Bogor and Sukabumi to the characteristics of lithology lithologic unit occupied by the old sediments intruded by igneous rocks in igneous rocks such as granite, granodiorite, diorite and andesite. Usually the area around the igneous rocks occur terobosaan remineralization process containing a very economical value such as tin and copper ore deposits. Climate in the Banten region is strongly influenced by Monsoon wind and La Nina or El Nino Wave . When the rainy season (November - March) the weather is dominated by the West wind (of Sumatra, the Indian Ocean south of India) are joined by winds from Asia passing through the South China Sea. August), the weather is dominated by the East wind which causes Banten harsh drought, especially in the northern part of the coast, especially when ongoing El Nino. Temperatures in coastal areas and hills ranging between 22 °C and 32 °C, while the temperature in the mountains with an altitude of between 400 –1350 m above sea level at between 18 °C -29 °C. The highest rainfall of 2712–3670 mm in the rainy season months of September to May cover 50% area of Pandeglang west and rainfall 335–453 mm in the month from September to May cover 50% area of Serang Regency North, the entire area of the city of Cilegon, 50% area of Tangerang regency north and the entire area of the city of Tangerang. In the dry season, the highest rainfall of 615–833 mm in April–December cover 50% area of Serang Regency north, the whole area of the city of Cilegon, 50% area of Tangerang District north and the entire area of the city of Tangerang, while the bulk the lowest rainfall in the dry season as much as 360–486 mm in the month of June to September 50% coverage area of Tangerang Regency south and 15% area of southeastern Serang District. Banten Province is subdivided into four regencies (kabupaten) and four autonomous cities (kota), listed below with their populations at the 2000 and 2010 Censuses, together with the latest (2014) official estimates. The cities and regencies are additionally subdivided into 140 districts, 262 urban villages and 1,242 villages. (a) The 2000 Census population for Serang city is included in the figure for Serang Regency. (b) The 2000 Census population for South Tangerang city is included in the figure for Tangerang Regency. Tangerang City was incorporated as an autonomous city on 27 February 1993 out of the Tangerang Regency, in which it previously served as administrative capital. It was subsequently replaced by Cipasera (see below). Cilegon City was incorporated as an autonomous city on 10 April 1999 out of the Serang Regency, in which it previously served as administrative capital. It was subsequently replaced by Serang (see below). Serang City was incorporated as an autonomous city in November 2007 out of the Serang Regency, in which it previously served as administrative capital. It was subsequently replaced by Ciruas. South Tangerang City (formerly Cipasera) was incorporated as an autonomous city on 29 October 2008 out of the Tangerang Regency. in which it previously served as administrative capital. It was subsequently replaced by Tigaraksa. Most people in Banten embrace Islam with religious fervor is high, but other religions can coexist peacefully. Potential community and cultural distinctiveness of Banten, among other martial art Pencak Silat, Debus, Rudad, Umbruk, Saman Dance, Mask Dance, Dance Cokek, Dog-dog, Palingtung, and Lojor. In addition, there is also a relic of the heritage include Great Mosque of Banten Lama, Makam Keramat Lama, and many other relics. In Banten lives the Baduy people. The Baduy are the original Sundanese people who still maintain the tradition of anti-modernization, both how to dress or other living patterns. The Baduy-Rawayan living in the Kendeng Mountains Heritage area of 5101.85 hectares in Kanekes, Leuwidamar subdistrict, Lebak. Baduy villages are generally located in the Ciujung River basin on Kendeng Mountains. This area is known as the area of land inherited from ancestors, which must be maintained, and should not be tampered with. The natives who live in Banten Province speak a dialect which is derived from the Old Sundanese language. Dialect is classified as coarse language in modern Sundanese language, which has several levels of the level of fine to coarse level (informal), which was first created in the Sultanate of Mataram occupied Priangan (the eastern part of West Java province). However, in the southern part of Banten such as Lebak and Pandeglang, the local people use of Archaic Sundanese, Modern Sundanese, and Indonesian. ; While in the northern part of Banten such as Serang and Cilegon, the local people tend to use the Javanese language as there are many Javanese migrants there. In the northern part of the city of Tangerang, Betawi is also used by Betawi immigrants. In addition to the Sundanese, Javanese and Betawi, Indonesian also used primarily by migrants from other parts of Indonesia. Golok is the traditional weapon in Banten which is the same as the traditional weapon of the Special Capital Region of Jakarta. The traditional house in Banten called Rumah Panggung with roof thatching, and the floor is made of pounded bamboos split. While the walls were made from the booth (gedek). To buffer stage house is a stone that has been created in such a way that ends shaped beam decreasing as the stone used for pounding rice pedestal. The traditional house is still widely found in areas inhabited by the Kanekes People or the Baduy. At the time of the formation of Banten Province, Djamal Hakamudin was appointed as the first governor by the Indonesian central government. In 2002, the Banten provincial parliament (Dewan Perwakilan Rakyat Daerah or DPRD) chose Djoko Munandar and Ratu Atut Chosiyah as governor and deputy governor of Banten respectively. In early 2006, after Djoko Munandar was suspended during an investigation into alleged corruption, Ratu Atut Chosiyah was appointed as acting governor . Finally, on 6 December 2006, a provincial election was held which was won by Ratu Atut Choisiyah as governor and Mohammad Masduki as deputy governor; both served in the period 2007-2011. Banten is located in the most western tip of Java island has a very strategic position, and has a huge economic potential either for local, regional, national, and even international scale. Facilitation of the movement of goods and passengers from and to the activity centers of national, regional and local level in the province of Banten became very important in the effort to support economic development in the province of Banten. Banten province is divided into three Areas of Work Development that has an icon or characteristic of communications facilities in the province of Banten, as the activity is more pronounced than with other transportation infrastructure. Work Area I, namely the city of Tangerang and Tangerang regency. Inside are Soekarno-Hatta International Airport which is the gateway entry of goods and passengers by air transport to Indonesia. Work Area II, the city of Cilegon and Serang District. Inside are the Port of Merak gateway entry of goods and passengers from the island of Sumatra to Java. Work Area III, which Pandeglang and Lebak. Inside are several railway Station which is the entrance of goods and passengers, especially from and to Jakarta. In general, the transportation sector can be categorized into three parts, namely land transportation, sea transportation and air transportation. The third section has a very important role in economic development in the province of Banten. Until 2006, the condition of 249.246 km of national roads were in good condition, 214.314 km under moderate conditions, and as long as 26.840 in damaged condition. Provincial road conditions until the end of 2006 with a total length of 889.01 km roads were in good condition at 203.670 km, 380.020 km moderate condition and the damaged condition of 305.320 km. National roads in the area of Banten province currently has a traffic volume average of 0.7 which means that the smooth flow of traffic disturbed by the activities of trade, industry, shopping centers along the way as well as the limited capacity for width of the road an average of 7 meters on the national road in North Banten (Tangerang-Merak) and the Ciputat-Jakarta segment. Performance of service roads on provincial roads are generally quite well with the ratio of traffic volume per average capacity of 0.4. Traffic congestion is generally localized which occur at the local community center. To serve the movement of passengers and goods in the area of Banten province, there is public transportation Inter-City Transportation In the province at the time was still being served by the small size vehicles, and in its implementation still felt optimally integrated. There are 63 route with the number of vehicles that serve as many as 3,788 Inter-City In both the city and regency of Tangerang. As for the AKDP Serang, Cilegon, Pandeglang and Lebak served 66 stretch with a number of vehicles as much as 1,436. To reach areas that are not yet available public transportation, there are several transportation pioneer serving Cikeusik-MuaraBinuangeun-Sp. Baya -Cikotok -Pasir Kurai-Cibareno routes with distance along the 106 km. Pioneer transport is served by 2 DAMRI medium-size bus. Up to 2005, of the total rail line along the 305.9 kilometer, only 48% is a rail line that still operates with the average amount of movement of passenger trains approximately 22 trains per day, and a freight train as many as 16 trains per day. The decline in the facility services has implications for the declining tendency also on the number of passenger and goods. The railway network in the province of Banten along 305.90 km majority are 'single track' which consisted of Merak-Tanah Abang, Tangerang-Duri, Cilegon-Cigading along 141.6 km, and disused railways are Rangkasbitung -Labuan, Saketi-Bayah, and Cigading-Anyer along 164.3 km. Currently the Maja - Citeras - Rangkasbitung railway will be electrified and will be part of the KAI Commuter Jabodetabek. In Banten province, there are five ports consisting of two cultivated port that is Port Ciwandan and Port Bojonegara and three ports that are not cultivated comprising Port of Karangantu, Port of Labuan, and Port of Bojonegara. Soekarno-Hatta International Airport nationally is the main airport in Indonesia as the gateway entrance of goods and passengers from within and outside the country. In addition there are also other airports such as Pondok Cabe airport in South Tangerang, Budiarto Airport in Tangerang and Gorda Airport in Serang. Pondok Cabe Airport is an airport for general aviation activities, Budiarto Airport is the airport used for training flight activity. While Gorda Airport was used as a military airport used by the Indonesian Air Force. Ujung Kulon National Park is one of the national parks and nature conservation sites that are important in Indonesia, and the world. This national park is located in the most western peninsula of the island of Java, plus some smaller islands as well as Peucang, Handeuleum Island, and the island of Panaitan. The highest point is Mount Honje. The distinctive feature of this national park is its role as a natural habitat of wildlife species that are protected, such as the Javan rhino, deer, antelope, buffalo, various species of primates, wild boar, jungle cat, sloth, and various species of birds. This area can be reached via Labuan or via the sea by boat to one of the islands there. Ujung Kulon has been equipped with various means of telecommunications networks, electricity, and clean water. Tourism facilities such as accommodation, information centers, travel guides, and transportation facilities have also been provided. UNESCO has stated that the Ujung Kulon area is a nature reserve world heritage sites. Pulau Dua which is located near Serang is well known the natural beauty of the ocean in the form of clusters of coral, various types of fish, and of course various types of birds. The area is about 30 ha. Each year between April and August, the island is visited by thousands of birds from 60 species originating from various countries. Approximately forty thousand of these birds fly from the continent of Australia, Asia, and Africa. Two of the island can be reached by traditional boats or motor boats; or on foot within 15 to 30 minutes through aquaculture area in Sawah Luhur and Kasemen. Due to sedimentation for decades, the island has been united with the mainland Java. Mount Krakatau actually included the province of Lampung is located in the Sunda Strait. This mountain is one of the most famous mountains in the world, because of the devastating eruption in 1883. The eruption voice heard up to the Australian Continent region, even heat clouds blanketed some areas of Europe during the week. A huge explosion of Krakatoa then formed Anak Krakatau which surfaced in 1928 that still remains active. Although located in the Strait of Sunda and Lampung, nature tourism is more easily accessed in Anyer-Carita Beach, and permission to land on the island volcano Anak Krakatau also be obtained in this area, it takes about an hour by speedboat to reach Locations this tour offers natural attractions such as camping, hiking, fishing, and natural scenery of the sea. Tanjung Lesung Beach is located in the Panimbang subdistrict of Pandeglang district in the Banten province. The beach is located in the western part of the Pandeglang district and has an area of approximately 150 hectares. This area is proposed to Special Economic Zone since 2012 and Tanjung Lesung SEZ been officially in operation since 23 February 2015. Development of the Tanjung Lesung SEZ are mainly focused on the activities of Tourism and Creative Economy.